I had a dream ….. unfortunately it wasn’t about racial harmony, a solution to the economic crisis, world peace, or, well, anything remotely serious at all. Of course not. I’m deeply shallow. It was about pets. The star of my subconscious show was a rabbit. Well, two rabbits, actually. Child Two, who has always been mad keen on rabbits, had a new one in this dream. 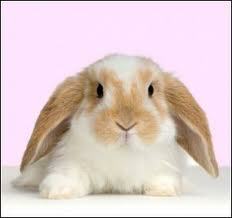 It was a huge great white fluffy thing, with occasional beige splodges, and actually a fine figure of a bunny. It was called Snowball. Then Child Two let the rabbit out onto our roof terrace (we don’t have one, but could my dream be suggesting we need one?) which seemed to stretch for acres and was beautifully turfed. Lo and behold, the rabbit hopped over to another, identical rabbit. Which one was ours? Ok, ok, so I know I’ve ripped this dream off entirely from a Lauren Child ‘Charlie and Lola’ story called something like, We Really Can Look After Your Dog, in which the adorable dachshund, Sizzles, gets mixed up in the park with another adorable, identical sausage dog, with gigglesome consequences. So, in the dream, I was poised for a similar plot to unfold. But no sooner had I said to Child Two, ‘I’m sorry, but we’re just going to have to decide which one is Snowball and leave the other behind,’ than an enormous golden retriever dog appeared. And it was ours. I can’t say how, or more to the point, why we acquired this creature. It was just there, and unquestionably coming back inside with us, no doubt to wreak havoc by swirling its golden fur, massive tail and four blundering paws around like Prince Charming in Shrek. My first thought was, ‘Oh my goodness, how am I going to explain this dog to the cats?’ Yes, I feel guilty about my existing pets, even in a dream. I’m not sure what this dream was trying to tell me. Get a rabbit? Surely not. Get a dog. Most definitely NOT. Stop worrying about pets? Possibly. Get a life? Probably. Get a roof terrace? Hmm, tempting. Spend more time thinking about world peace? Yep, definitely. Sigh.